I forgot to post about it when The Joys of Hashing came out, but it is never too late to blow my own horn. It is out and you should get it. 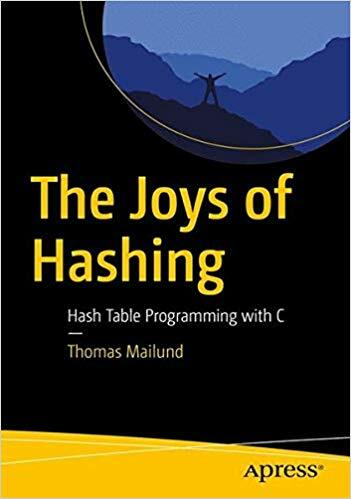 Build working implementations of hash tables, written in the C programming language. This book starts with simple first attempts devoid of collision resolution strategies, and moves through improvements and extensions illustrating different design ideas and approaches, followed by experiments to validate the choices. Hash tables, when implemented and used appropriately, are exceptionally efficient data structures for representing sets and lookup tables, providing low overhead, constant time, insertion, deletion, and lookup operations. The Joys of Hashing walks you through the implementation of efficient hash tables and the pros and cons of different design choices when building tables. The source code used in the book is available on GitHub for your re-use and experiments. Those with at least some prior programming experience, especially in C programming.